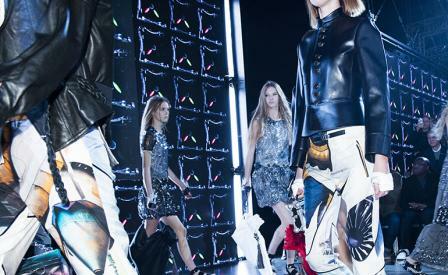 Mood board: A sci-fi installation with multiple video screens and electrical panels set the scene for Nicolas Ghesquière’s high-tech spring collection for Louis Vuitton. Part boho, part biker, this collection was wholly original, borrowing plenty of leather and studding from the 1980s, bouncing flounces from the 1970s and a glossy, but straight-from-the-street 21st century vibe. Best in show: The gladiator biker skirts with split leather studded panels were exceptional in this show, but our favourite looks were the full length T-shirt shaped chiffon dresses crusted in intricate silver metal embroidery that were worn with badass platform sandals with metal chain detail. Also noteworthy? The newly crafted biker leather dress made from panels of leather as well as Vuitton’s LV and square Damier logos. Finishing touches: The clothes may have glistened, but the accessories brought the girls right down to the urban sidewalks with a tough-girl edge. Sling-back creepers, monster platforms and cowboy booties with silver tips were paired with half-gloves made from LV logo’d tape-ribbon. As for Vuitton’s famous bags, they came spray painted in bright colours and shaped like pyramids swinging from wrist straps.